Do you ever have one of those days where you just want to make a rum and coke (or two), open a sleeve of thin mints (or two), and stare out the window? If you’re like me, your boss frowns on such behavior so you feign productivity and hope the lottery ticket in your pocket has the magic numbers. It’s been a week filled with such days for me and mine. Way back in December, I wrote an Obituary Before the Fact in honor of our dog Buffy. As is often the case, with the help of good drugs and a little luck, she rallied for a couple of months. My wife, to her credit, managed to mix and match pills but even that wasn’t enough. All good things, as they say, must come to an end. Over the weekend, we could see her failing. By Sunday, she couldn’t lie down without pain and you could see her heart beating through her chest. We knew there wasn’t any magic left in those pill bottles. My wife and I, in so many ways, have lived a charmed life. Both our parents are alive and in relatively good health; our children are physically active, do well in school, and only hate us on occasion; and thankfully, we are (more or less) financially secure-ish (money is an object but we don’t skip meals). Despite creeping ever more into middle-age, we both still occasionally feel decidedly not-grownup. Some of that, I think, is the long stint in graduate school. We didn’t buy our first couch until about five years ago and cinder blocks are still our first thought when we need book shelves. But there are moments in life that become important markers of adult-hood: buying furniture from an actual store and not off someone’s driveway; watching our kids start high school; paying attention to a retirement account and wondering which investments have the biggest yield. We’ve also reached that age where are parents really are getting old (sorry mom and dad) and we can see it. Those of you of a certain age know what I’m talking about. We are past that age where we look at someone 45 and think they are old. This is the time of life where we wake up one day and realize our parents are on the down hill side. They’ve had “treatments,” “surgeries,” and use Performance Enhancing Drugs just to get from morning to night. Conversations increasingly sound like an episode of ER (or Scrubs when everyone is in good humor). If you’re lucky like us, it’s a slow trip down that hill but you know that soon enough they will depend on you instead of the other way around. We might add the death of a family pet to the list of grownup things. Death is apropos of nothing and rarely schedules itself for our convenience. I think, in the back of our minds, we were hoping that once Buffy rallied she would simply die in her sleep. Such a peaceful death would end her pain, keep us from making a decision about putting her down, and help our family say goodbye. Monday morning, though, my wife had to be at work at 10:00, I had meetings in the late morning, our kids were off to school, and the poor dog could barely stand up but she hurt too bad to lie down. Short of levitating, she had to choose one or the other and they both hurt. And adulthood came pounding through the door. The vet told us it would take about two weeks for us to stop listening to the silence in the house. The tinkle of the collar on the water bowl, the clickety-clack of nails on the tile, the flap of the doggie door–their absence is pronounced throughout the day. I’ll admit that I don’t feel the loss to the degree that my wife and oldest son do. Buffy was really their dog. She slept in my son’s room and she was, in so many ways, my wife’s close companion. They took walks and before my wife worked outside the home, they had long conversations. Let’s face it: when you stay home with the dog, she hears all your dirty secrets. Pet’s are great listeners, they are always sympathetic, and there’ s no danger of loose lips sinking any ships. Woman’s best friend for sure. In some ways, adulthood robs us of the simplicity of death. We not only mourn, but we recognize the responsibilities we had to the living and the dead. The temptation is question and second-guess, wondering if we did all we could. Hindsight might be 20-20, but it also can be a well of despair that threatens to drown us when we look backwards for too long. The great thing about youth is the ability to always look forward. (The price of youth, by the way, is also the ability to always look forward. So what if I broke my arm last time I did this! Let’s jump off the roof onto the trampoline again!) Growing up, I guess, is the art of looking forward while balancing memories of the past. 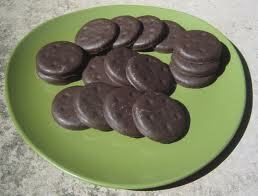 You had me at the plate of Thin Mints. This was a beautiful tale of another phase in the evolultion of a human lifetime. It sure was timely for friends of mine. I’m so sorry for your loss. It is difficult to lose a pet. It wasn’t so long ago that I had to put my first pet down, and a year later a second. The second was easier because I had come to terms with the decision making process. But, I agree with your vet. It takes about two weeks before you stop seeing their furry tail pass by or them looking up at you. I miss my kitties. But, life goes on. I, too, feel very lucky. All of my parents and grandparents have lived very long lives. No premature deaths in my immediate family. Great writing…. Thanks for the kind words. You are braver than us. I’m not sure we are quite up to a second pet. At least not yet. Not rum and coke, but vodka and mango juice; I hit my lethal limit on thin mints yesterday (the poor Girl Scout thought I was kidding when asked her how many CASES of T-M’s she had, and then bought …them…all…but it’s a long-standing addiction, and I have no lasting regrets) Otherwise, a stellar post! I turn 45 next Friday, glad to know I’m not “old” anymore! And I am also watching my dad become more and more dependent on me, and he hates it, but has bowed to the necessity of asking for help. (sigh) never thought I would grow up either, it seems to happen to the best of us, and then to the rest of us. I don’t think I’ve ever had vodka and mango juice. Looks like a weekend experiment (plus it’s clearly healthy since there is fruit juice involved). The phrase “Growing Up” is over used and over rated. Because all the people I’ve seen who claim they’ve GREW UP end up looking at things critically, finding more faults than advantages, and trying to approach life with held back emotions and much less optimism. Children know the real truth. That life is more than just being mature and critical and decisive. It’s about being alive, and thankful for all that has happened, and all that is yet to come. Whether good or bad, it shapes us into the perfect form we are. Thank you for the comment. I agree that we need to embrace, and accept, our emotions.